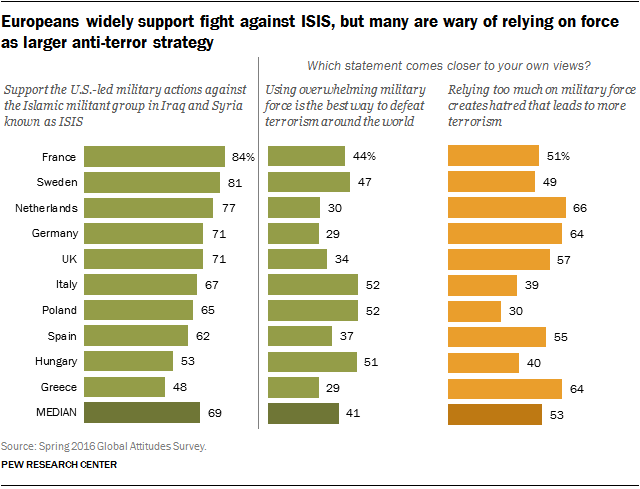 After a year of escalating terror attacks against Western targets, people across Europe are widely supportive of U.S.-led military action against the Islamic militant group in Iraq and Syria known as ISIS. But when it comes to a broader strategy to defeat terrorism around the world, many Europeans fear relying too much on military force will create hatred that leads to more terrorism. A Pew Research Center survey conducted this spring, before the most recent terror attacks in France and Germany, found that a median of 76% across 10 European countries saw ISIS as a major threat to their nation and 69% supported U.S.-led military actions against the group. When asked about defeating terrorism more widely, only 41% were convinced that using overwhelming military force was the best strategy. A larger 53% thought relying too much on force would be counterproductive. In nine of 10 European Union nations surveyed, more than half supported U.S. military action against ISIS, while many simultaneously expressed concern about depending too much on military force as a strategy to defeat terrorism. Substantial shares of those who were worried about overreliance on force – ranging from 39% to 77% – supported the U.S.-led military actions against ISIS. But those who believed, in principle, that using overwhelming force is the best way to combat terrorism were much more likely to support U.S.-led military efforts against ISIS. 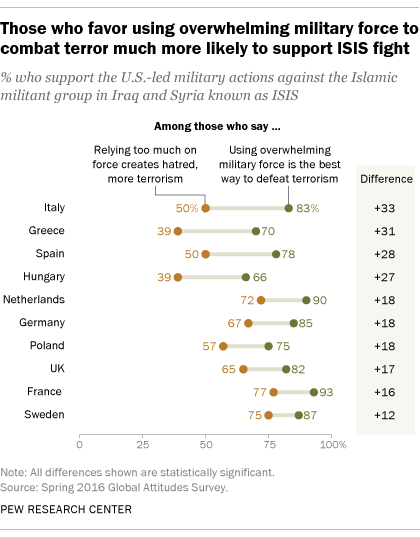 This gap in attitudes was especially large in Italy, where 83% of people who favored the general use of military force supported U.S.-led actions in Syria and Iraq, compared with just 50% of those who were concerned about military action leading to more terrorism. Similar differences of roughly 30 points were evident in Greece (70% vs. 39%), Spain (78% vs. 50%) and Hungary (66% vs. 39%).